Since 1969, Simba's newsletters and business intelligence reports have delivered metrics and analysis deemed critical by top education market executives in the textbook and educational resources publishing industry. Our market research reports offer the comprehensive and in-depth analysis you need to understand the publishing industry's many trends affecting the U.S. education market, such as the growing demand for electronic and alternative instructional materials in PreK-12 education. The market for PreK-12 education is seeing a growing penetration of digital educational resources such as tablets and mobile devices used by educators into the classroom, in an attempt to make the learning experience more engaging and personalized. Simba Information's constantly updated and insightful research reports on the U.S. education market are the most trusted source for the highly competitive $3.5 billion higher education publishing industry as well, which is undergoing a similar shift to the one seen in PreK-12 education from printed instructional materials to digitized or alternative educational resources. The higher education market is rife with participants looking for alternatives to the "traditional" college experience, and the growing amount of diversified education resources coming out of higher education's publishing industry is making it possible for students to have a larger say when choosing their educational paths. Simba's education market research products also include insight into the academic testing trends, professional development trends, and publishing industry marketing strategies that are currently shaping the education market. No reports match your search criteria. Simba Information is the leading authority for market intelligence and forecasts in the information and media industries. Our comprehensive, timely, quality research and presentation of market intelligence have provided key decision-makers at more than 15,000 client companies across the globe with timely news, analysis, exclusive statistics, and proprietary industry forecasts. Simba's extensive information network has been delivering valuable independent perspective on the people, events, and alliances shaping the media and information industry since 1989. 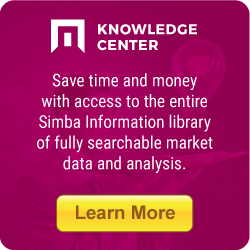 Simba Information - A division of Market Research Group, LLC.